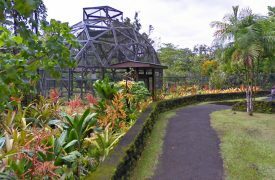 A week-long celebration of Hawaiian culture on the Big Island’s Hilo side during the week of Easter, visiting Hilo during the annual Merrie Monarch Festival is a wonderful opportunity to explore and enjoy traditional Hawaiian hula, arts and crafts, music, and other events. It’s also the jumping off point for larger international hula competitions and the headquarters for competitive hula in all of Hawaii. Dedicated to the memory of the last king of the Kingdom of Hawaii, David Kalakaua, the festival is a celebration of his devotion to the arts. With a special focus on music, dance, and Hawaiian tradition, the festival serves as a mindful opportunity to consider one’s roots, ancestors, and culture throughout the years. Kalakaua was particularly influential in preserving and reinvigorating interest in ancient Hawaiian traditions throughout his reign. Due to the largely suppressive teachings of the missionaries who called Hawaii home, Kalakaua’s rule was marked with a resurgence in pride surrounding Hawaiian mythology, medicinal practices, important chants, and, most of all, hula. Hula served as a bridge between generations in ancient times. Because ancient Hawaiians had no written language, chanting and hula was used to measure time, record genealogy, pass down myths and legends, share religious teachings, and preserve history. It was the primary vehicle by which culture was preserved and passed down through the generations. The Merrie Monarch Festival celebrates that notion and recognizes that despite the many tools we have to accurately and permanently record information, knowing and understanding the ways of those who came before you is a way to honor and respect their memories. Though the festival today is rooted in competition, with the winners heading to larger international competitions, the festival serves as an annual gathering point for people of every age to share their family’s ways and traditions with those from every Hawaiian island. 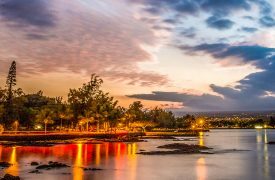 This year’s festival will take place in Hilo, Hawaii from April 21-27, 2019. Tickets are available online at the Merrie Monarch Festival’s website. This event is difficult to get tickets to as it sells out very quickly, however there are public events all week long that do not require tickets to attend. 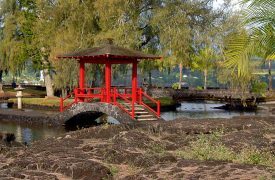 in historic downtown Hilo you will find the beautiful Lili’uokalani Gardens, the largest, authentic Edo-style ornamental garden outside of Japan.